Congratulations on your engagement! The Parish and Pilgrimage Church of St Michael and St Mary Magdalene can offer you a beautiful setting for your wedding. 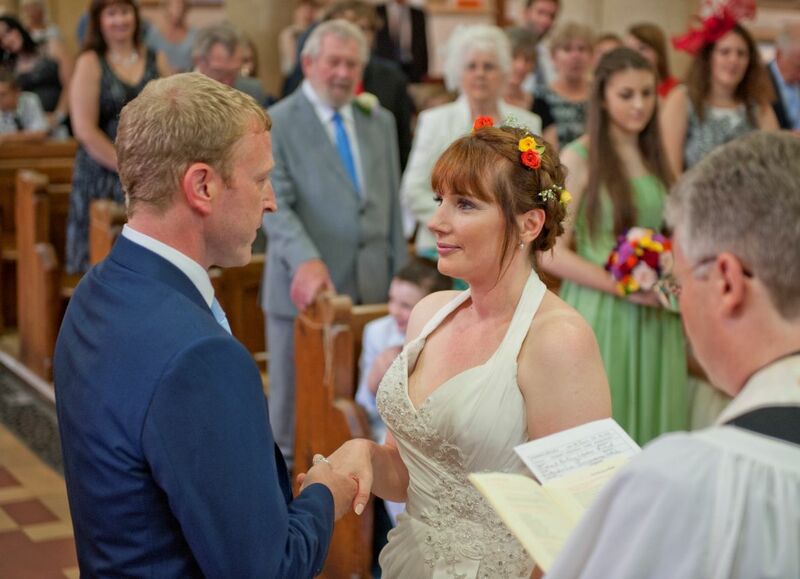 If you're thinking of getting married in our church then we would love to hear from you! 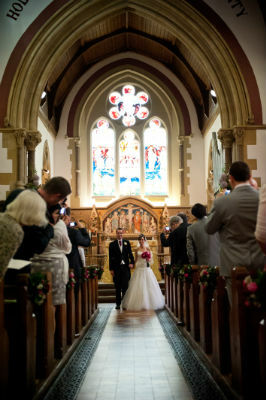 We are a popular Church for weddings and get booked-up very quickly. If you'd like to book a wedding at our church then you or your partner will need to come along to the Parish Office on either a Tuesday 3.30pm-4.30pm or a Wednesday 6.00pm-7.30pm. You don’t need an appointment, just turn-up and a member of the Clergy will see you. They will ask you questions to see if you are able to be married at this Church. You will be given a Wedding Pack to take away and forms to return if you wish to proceed. A church is so much more than simply a venue for your wedding. For some, the spiritual dimension of a church wedding is really important. You will be making your vows in the presence of God who there to bless your marriage. Church buildings offer centuries of history. They have been the venue for countless weddings over the centuries. Imagine all the couples who have married at St Michael & St Mary Magdalene over the many years, some of whom may well have been your family. By marrying in a church you can feel that you're becoming part of history itself. Unlike many wedding venues, the church is interested in much more than just your wedding day and really cares about the rest of your married life together. As a church, after your wedding day, we will be here for you whenever you need us. You might like to bring back a child for a christening or you might like to visit us again at Christmas or Easter. We will be here for you whenever you need us and you will always receive a warm welcome when you visit. As well as playing a special role in your wedding day, the church would love to become a part of your future story too. Can I have a Church Wedding? There are a few misconceptions about whether couples can have a church wedding or not. You don't need to go to church to have a church wedding and you don't need to be baptized (christened) to have a church wedding. We really aren't worried if you already have any children - we would just love to see them on the day playing a special role in your ceremony. The chances are that if you would like a church wedding then you can have one - so if this is the case, please just ask! If one or both of you have been divorced you may still be able to be married in a Church. This has been the case in the Church of England since 2002. If you'd like to get married in our church then please contact us and one of the Clergy can explore this possibility with you. Can I get married at St Michael & St Mary Magdalene? You can marry in our Church if you live within our parish or have what we call a qualifying connection to our church. To see whether you live in our parish, you can click here: PARISH MAP. Our parish covers much of Easthampstead, Wildridings, Great Hollands, Birch Hill, Hanworth and Jennett's Park; but if you're still not sure whether you live in our parish or not then please contact the PARISH OFFICE and we can check for you. If you're unsure whether any of the above apply to you but you would really like to get married in our church, then please get in touch with the Parish Office and we can explore the possibility with you. Probably less than you think. The cost of a standard wedding at this Church in 2018 is £543. There are additional charges for things like the Organ, Choir, Bells, Flowers and copyright for Video and Photography within the Church. The full cost of a wedding can be confirmed by the Clergy and the Parish Office. How do I confirm my Wedding Booking? The Arrangements Slip, indicating your choices. You and your partner’s Birth Certificates. The Application Form with correct details. A cheque for £100 made payable to “Easthampstead Parish Church”. NOTE: The outstanding balance must be paid two months before the date your Wedding. Christian marriage isn't just about going to church and saying the right words. It’s a lifelong commitment and needs to be taken very seriously, which is why a lot of prayer and thought will go into making sure you’re prepared for it. To help you prepare we will be inviting you to attend a meeting. At the meeting we will discuss the meaning of the Service, check details and answer any questions you may have. The meeting is held at 8pm in the Annex attached to the Church. I've booked my Wedding - what else do I need to plan and prepare? When you come to book your Wedding in the Parish Office we will give you a Wedding Pack which will give you more information as to what else you might need to plan in preparation for your wedding.